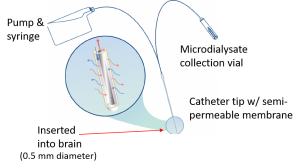 Microdialysis is a sampling technique that is used for continuous measurement of free, unbound analyte concentrations in the extracellular fluid of a tissue. The inventors have developed a new method to detect several chemical molecules simultaneously in microdialysis fluid. This means they can detect these molecules very quickly, enabling continuous monitoring with no fluid contamination. Their method also has the advantage of relying on an optical detection principle and does not require any reagents. The sensor can operate as an external unit connected to a microdialysis probe or it could be directly inserted into a tissue which would remove the need for additional components and a microdialysis pump. The initial application of this technology is for brain chemistry monitoring in traumatic brain injury patients. However the technique could also be applied to other organs and tissues, for example skin grafts in plastic (reconstructive) surgery, liver transplantation, gastrointestinal surgery, and the monitoring of muscle, adipose tissue, and blood in newborn babies, diabetic patients and critically ill septic patients. The question for the i-Team is to investigate the need for this type of sensor beyond critical care brain monitoring, and determine the relative sizes of the various possible markets.